I have had this book sitting on my shelves, waiting to be read for 3 years. I'm not really sure why it took me so long to read it - I think maybe it had something to do with the fact that I only really picked it up in the first place because everyone seemed to be talking about it, not necessarily because it was something a picked up because I wanted to read it. Nonetheless, it is read now... and I have thoughts. 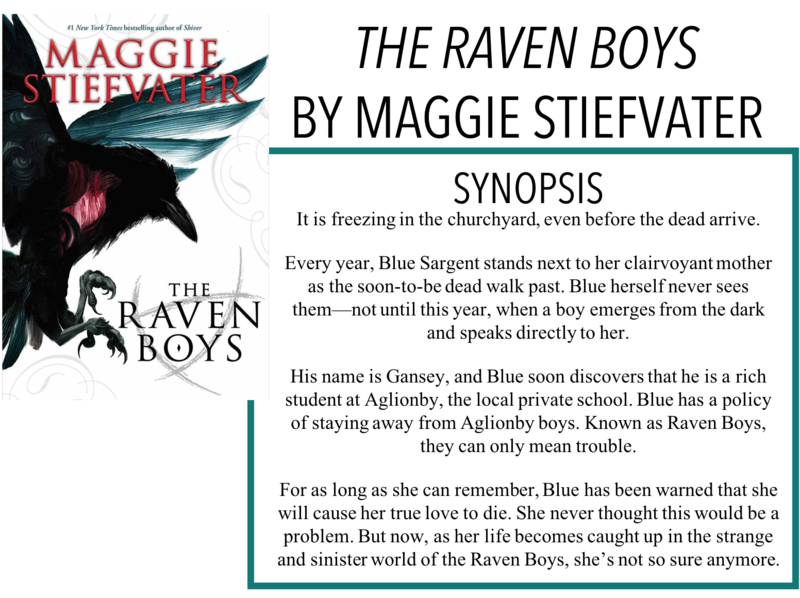 I am back with another book review, The Raven Boys by Maggie Stiefvater. This story follows Blue, a girl who has been told by her psychic mother - really every psychic she has ever encountered, and there have been lots - that she will cause her true love to die. In her sixteen years of life so far, this hasn't really been a problem. One night, she is helping amplify energy in an old abandoned church with her aunt to find the spirits of those who will die in the coming year. And for the first time, she sees someone. The spirit of a boy named Gansey who, according to her aunt, is either Blue's true love or she killed him. I think the storyline of this book is really interesting and I liked the originality behind the concept. There is, of course, much more to the story than just Blue's love life - Gansey himself is hunting for ley lines and Glendower. Blue meets Gansey's friends, including Adam, Noah, and Ronan. Together, they look to find the ley lines and gain Glendower's favour. At first, I wasn't really sure how Stiefvater would be able to create a story that was four books long out of this base plotline but I'm getting the sense that each book will work its way a little closer to their goal. This book had a subplot element that was largely solved, but it still left room for the other books in the series. I really liked the writing style, it was well-paced and despite being over 400 pages, a quick read once things got going. I found the prose to be descriptive and just generally well done, it's been a while since I've read such a well-written book. I appreciated the short chapters, although I kept telling myself one more chapter which inevitably turned into a dozen more because some were so short. It took me a bit to get the multiple third-person POV's straight, even though Stiefvater did a good job of including the character's name fairly early on in the first sentence of a chapter, but once I did, I was able to roll with it quite easily. I think that the synopsis makes this book sound a bit more like a romance than it actually is - there are definitely some romantic elements thrown in there but it is a slow-burn in the background of the main story. I am excited to see where things go with the romance alone because it seems like Stiefvater really knows what she's doing there. I already own book two, so I know I'll pick that one up but I'm a little on the fence about the rest of the series. This definitely wasn't a bad book, I just don't know if I'm really in the mood to continue the series all the way to the end. I will, of course, revisit this after I read the next book in the series. Overall, a unique story that has good bones, I look forward to book two.